The most common symptoms of menopause are hot flashes. 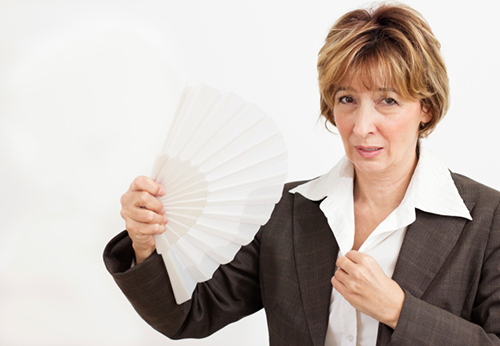 Hot flashes are a problem for 65%–80% of American women with menopause. Many of these women choose not to use hormones or cannot take them for medical reasons. As a result, there are various alternative methods and products marketed toward women to reduce hot flashes. The North American Menopause Society (NAMS) expert panel explored evidence on whether these methods work and how safe they are—and made recommendations that were recently published in the NAMS journal Menopause. “Many women try one thing after another, and it is months before they stumble upon something that truly works for them,” explains study author Janet S. Carpenter. The NAMS panel analysis did find strong evidence that certain therapies work for menopause, including certain non-hormonal prescription medications and two behavioral approaches. They also found that a supplement, and other behavioral and lifestyle treatments and approaches had benefits, but stronger evidence was necessary. Also, herbs and supplement evidence was considered insufficient, negative, or inconclusive. The research team found that the gold standard for determining the effectiveness of therapies—randomized, double-blind, controlled trials—showed that sleep hygiene, a behavioral therapy approach with combined relaxation techniques, and learning to take healthy approaches to the challenges of menopause, were significantly effective in the reduction in a woman’s hot flash problems ratings. The panel also recommended two mind-body approaches for postmenopausal women with hot flashes—clinical hypnosis and “structured attention” therapy. Researchers also recommended caution against approaches with evidence that isn’t as strong, including the soy derivative S-equal, stellate ganglion block, stress reduction, and weight loss. Other NAMS-recommended therapies include gabapentinoids, serotonin-norepinephrine reuptake inhibitors, clonidine, and selective serotonin reuptake inhibitors. Caan, B., et al., “Effects of estrogen and venlafaxine on menopause-related quality of life in healthy postmenopausal women with hot flashes,” Menopause 2015; 22(6): 607, doi: 10.1097/GME.0000000000000364. “Taming hot flashes without hormones: What works, what doesn’t,” ScienceDaily web site, September 23, 2015; http://www.sciencedaily.com/releases/2015/09/150923082603.htm.